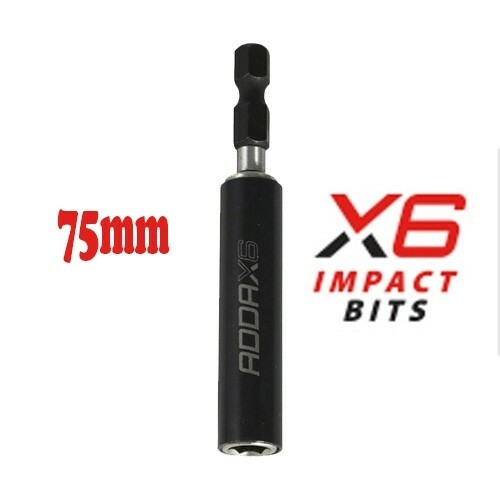 X6 Impact Bit Holders A high quality magnetic 1/4" hex drive adaptor with a unique "torsion zone" that enables the bit holder to withstand the extreme pressures exerted by an impact driver. With four different types of bit holders available. X6 magnetic screw holder has been specifically designed for installation of flat head screws. The sliding magnetic sleeve securely holds the screw in place to allow single handed installations in vertical or horizontal applications. X6 quick release chuck allows the user to rapidly change between multiple 1/4" hex drive accessories. Available in longer lengths to assist the user when working in awkward applications. X6 magnetic 1/4" hex drive adaptor with a unique "torsion zone" that enables the bit holder to withstand the extreme pressures exerted by an impact driver. X6 magnetic screw guide has a sliding sleeve designed so the user always drives the screw 90 degrees ensuring a flush finish. It also has the added benefit of reducing risk to finger injury as the sleeve covers the sharp screw threads.